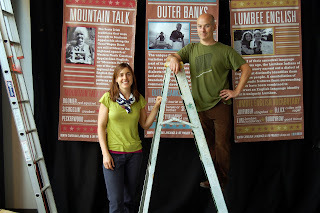 Danica Cullinan and Neal Hutcheson preparing the exhibit. Calling all dingbatters! ** When you head to the State Fair, make sure you get a taste of North Carolina dialect stew. A CHASS exhibit celebrating the state’s richly-flavored dialects will introduce fair-goers to the language traditions that are uniquely ours. 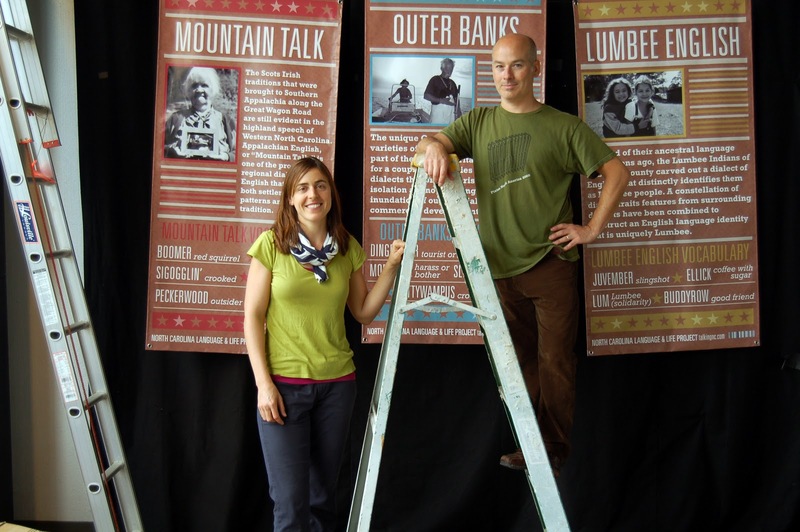 The NCLLP exhibit includes a variety of interactive posters, videos and audio stations where visitors can see and hear language variations from across the Tar Heel State. Can you tell the difference between Mountain Talk and the Outer Banks dialect? You may want to brush up on your dialect recognition skills before you go. **Pssst: a dingbatter is an outsider on Ocracoke.